Bordered by the Deschutes National Forest and the Cascade Mountains, Bend is the seat of Deschutes County in west-central Oregon. It lies along the Deschutes River at the eastern foot of the Cascade Range. U.S. Highway 97 passes through from north to south. In the 1800s, a town sprouted around Farewell Bend where wagons could readily ford the river. It was incorporated in 1905 and after 1911 grew swiftly when the Northern Pacific and Union Pacific railroads appeared, spurring a lumber and farming boom. Today, Bend (population 52,029) is a lumbering hub and year-round recreation magnet. 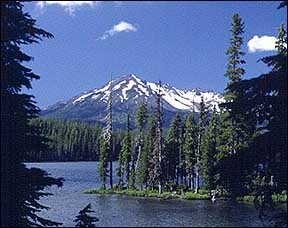 Popular area destinations include Deschutes National Forest, Newberry National Volcanic Monument and Mount Bachelor ski area. Abundant in galleries, Bend also is known for nearby High Desert Museum, a sprawling indoor/outdoor interpretation of the natural environs, its wildlife, and people of the past. Bend is also a mecca for mountain bikers, with many developed, well-marked mountain bike routes available. Pickathon Music Festival Hillsboro OR August2-4 The Pickathon Music Festival brings together the best in regional and national roots music for one beautiful weekend in a unique Oregon outdoor setting. Bluegrass, blues, swing, folk, blues, old-time, roots rock, alt-country, western, country, celtic, jug-band, and son jarocho are just some of the music styles played.